Summer means spending time outdoors, whether it be soaking up the sun or working in the garden. For one Virginia teen, however, a simple summer job turned into a life-threatening situation. After brushing against giant hogweed during work one day, Alex Childress thought he suffered a bad sunburn, a common seasonal illness in the summer that is usually treated with aloe vera. The teen realized his problem was more severe when the skin on his face started peeling that evening. After his mother rushed Childress to the hospital, the doctors immediately brought him to the intensive burn unit for treatment. Giant hogweed is an invasive plant that has spread throughout most of the United States. This seemingly innocuous plant looks much like milkweed, but grows up to 14 feet tall. This noxious weed is covered in a phototoxic substance that causes intense burns when it gets on the skin of humans and animals. For many gardeners and landscapers, special equipment is needed to remove this plant. While reactions to plants might not seem like a seasonal illness, giant hogweed thrives in the summer months. Outside of sports injuries associated with summer games, dangerous plants and weeds are another reason you may land in an urgent healthcare clinic. After recovering from the initial burns, Childress still needed to stay out of sunlight for six months. And believe it or not, Childress got lucky. The phototoxic substance that touched his skin can even cause blindness if it had gotten into his eye. New York’s Department of Environmental Conservation Giant Hogweed Program Coordinator, Naja Kraus, notes the detrimental effects of coming into contact with the plant. “Once you get it on you, it makes your skin unable to protect itself from the sun. It basically fuses your DNA in that area,” said Kraus in an interview with Good Housekeeping. To prevent becoming one of the 3 million urgent care patients a year, authorities should be made aware of any giant hogweed plants in the area. 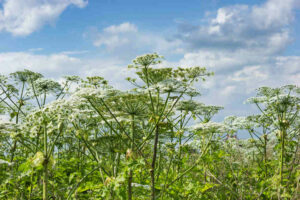 Report giant hogweed to authorities, including your local conservation department. Giant hogweed is currently present in the United States, Canada, and the United Kingdom. Look for green stems with purple blotches and hairy bases; large, white flower clusters in an umbrella shape; and large leaves up to five feet in diameter. If you’ve been in contact with giant hogweed, thoroughly wash the area and visit the best urgent care Houston has to offer for quick help.